I will be posting some of my learning from the Institute for Global Sustainability at the University of Vermont. I earned a Professional Certificate in Campus Sustainability Leadership. The posts on this blog will be about aspects of the course not related to education directly. Vermont, and the city of Burlington really impressed me. It is a great university town and they are on the cutting edge of global society with their commitment to sustainabilty. It reminded me of Portland and Seattle, in this regard. The city is an ultra-liberal, “green” state that resonated with my own political and social philosophy. They are way ahead of the game and like California, I feel that they are one of the drivers of where our society is headed. It is much like my favorite university town, Marquette, Michigan, but with a bit more money and New England influence. Many people making political statements all over place and plenty of Volvos and Subarus. Burlington’s Environmental Specialist, Jennifer Green, came and presented the projects the city is doing. My notes are below. If you don’t want to read the whole post, I will summarize. I was impressed with all of the projects the city does to promote sustainability. Not only regarding fossil fuels reduction, recycling, etc., but what they have done in the human part of sustainability. Jennifer Green is Burlington’s environmental specialist. She has over 20 years of community development experience, including work on gender equity, national planning, and environmental management with the Peace Corps, CARE International, Chemonics, and the World Resources Institute. Shortly after moving to Burlington in 1999, she consulted with the Vermont Energy Investment Corporation and later Efficiency Vermont. 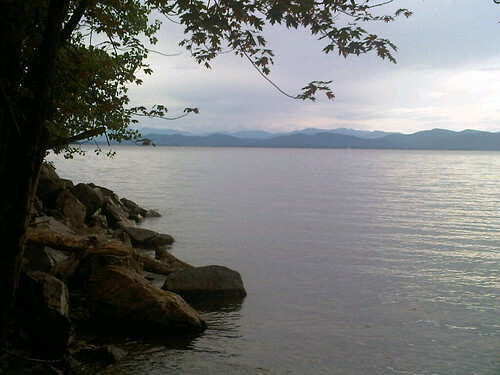 In addition to working for the City, Jennifer has taught several environmental and sustainable development courses at the University of Vermont. She has a masters in public adminstration from Columbia University and earned her PhD in environmental sociology from American University in 2005. My notes from her presentation. Cities and municipalities now have Sustainability Directors which is just behind the university sector in leading society’s charge towards sustainability. The Sustainability Director for the city of Burlington, Jennifer Greene, came and spoke to us. The first city (over 20 years ago) to have a Director was Portland, and they were way ahead of other cities. This is a growing field and she has 70 colleagues in her network. She is also has strong ties to the economic development office. Burlington is unique in that they have a strong Progressive Party that in the 1980’s, made the Church Street a walking street. The mayor, Peter Clavelle, was a visionary and he is the one responsible for the walking street. He also started the Burlington Legacy Project in 1999. This was the first comprehensive sustainability legacy plan. The key to the success was that he called in many different sectors like the business community, city government, and the universities. When the plan was formed, they were concerned about the “big box” stores in Williston as well as trying to keep housing affordable. The city is divided into 7 wards and they have monthly meetings. For example, the big issue in the ward 1 meeting last night, Ms. Greene said, was noise. There is a $500 noise ordinance that now the students collect money at the door for the fine to get around it. The Steering Committee consists of reps from all of the organizations. UVM, K-12 local school district, Fletcher Health (hospital), Main Street Landing (developer), United Way (NGO), etc. with 24 members. When they lost the Price Shopper grocery store, there was a lot of angst because people would have to go on the highway to a big chain grocery store and this would also mean that the dollars going out of town. They decided to move a community-owned Cooperative with locally purchased food and it is now the largest and most profitable coop in the USA. The population of Burlington is steady at 42,000, which is about a gain of 2,000 people in 50 years. There is a debate on growth and some want to keep it as it is and others feel they need to grow to keep the economy vital. When using student interns, it is important to tie it to a grade. Also, the ones that come in with a complaint are a great source of work. They also have a town meeting each year, the big takeaway was the poor quality food in local schools. It went to 50,000 pounds of local food, salads bars, composts in all schools and the food director is a nationally wanted speaker. The city has remained steady in electricity use from the 1980’s despite computers, microwaves, televisions in every room, etc. The city also has a Climate Action Plan. With the severe flooding this year, the bike path and 700 homes were lost. This is part of the “climate adaptation” plan they are doing.